A really quick and tasty supper. 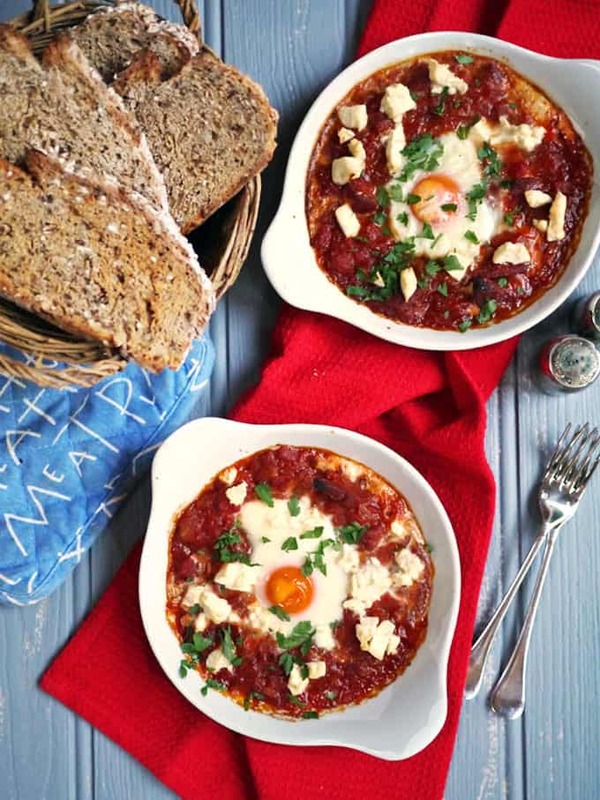 This Chorizo Baked Eggs recipe is on the table within half an hour, packed with delicious tomatoes and feta, it’s also high in protein. I know they tell you but parenting changes your pace of life, but seriously, GEEZ. We’re currently balancing his busy job and mine, along with two tiny people I really want to give heaps of attention too, fitting in rugby lessons, swimming lessons, play dates and cricket on a Sunday, seeing friends and also trying to keep up my get fit mission. It’s all good as it’s stuff that we all love, but something does go astray and mostly, that thing is us actually speaking to each other during the week. You know, that easy chit chat over dinner when you’re not rushing to do the next load of washing (or get on to watch the next installment of the box set). He generally gets home too late to eat with the children midweek, so we sit down together a little later, after they are in bed. Well, that’s the idea anyway. Over the last few months this has been lost a little in a jumble of going for a run, or catching up with emails, finishing that last bit of the project, or mowing the lawn. 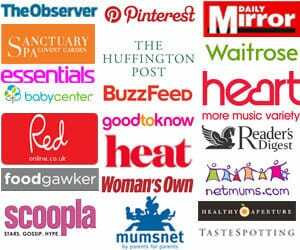 Seriously, though, when did being a grown up get THIS EXCITING? It’s quick, made with everyday ingredients, but super tasty and packed with good stuff. The utterly delicious Cirio tomatoes I’ve used, and the crumbled feta topping, make it feel particularly decadent and worthy of sitting to take a moment and really enjoy. Cook the dish a little less or a little longer depending on how runny or set you like your eggs. 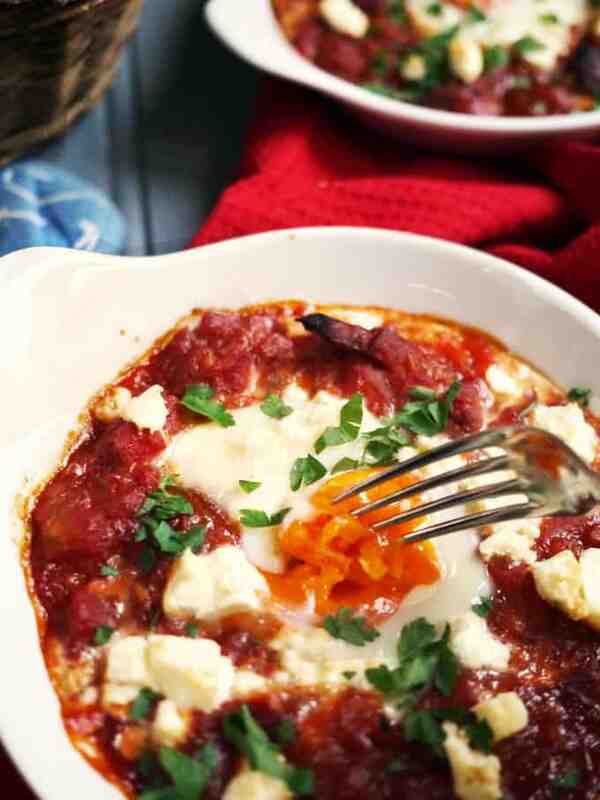 I used the Cirio Tuscan Chopped tomatoes for this recipe, it really is worth using excellent quality tomatoes as this is the basis of the whole dish. You can make the sauce in a deep, oven proof frying pan and keep the whole dish in this if you’d prefer to save washing up. Heat a small saucepan and add the chorizo. Allow the fat to release from the chorizo and then add the onion and garlic. Fry until soft and fragrant. Add the tomatoes and salt and pepper, pop the lid on and simmer over a low heat for about 15 minutes until thick. Add a splash of water if the sauce becomes too thick. 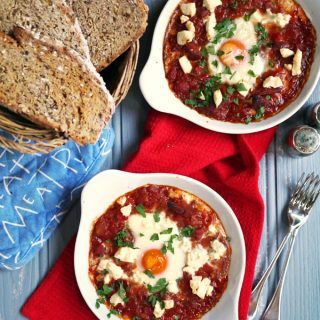 Share between two ovenproof dishes, make wells in the centre and break in the eggs. Crumble the feta cheese over the top. Pop into the oven for 15 - 20 minutes until the egg is cooked to your liking. Sprinkle with chopped parsley and serve immediately with a side of conversation..
What’s your quick, midweek, go to meal? 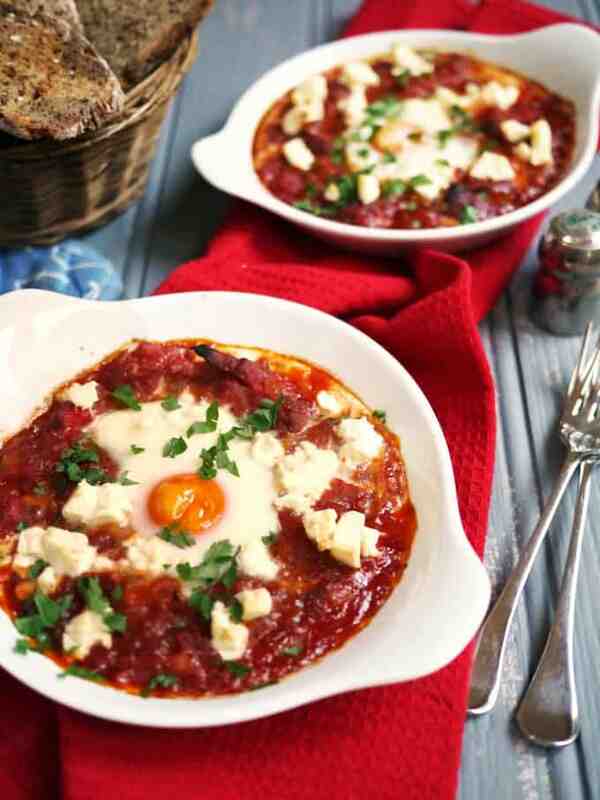 Pin the Chorizo Baked Eggs recipe for later.. 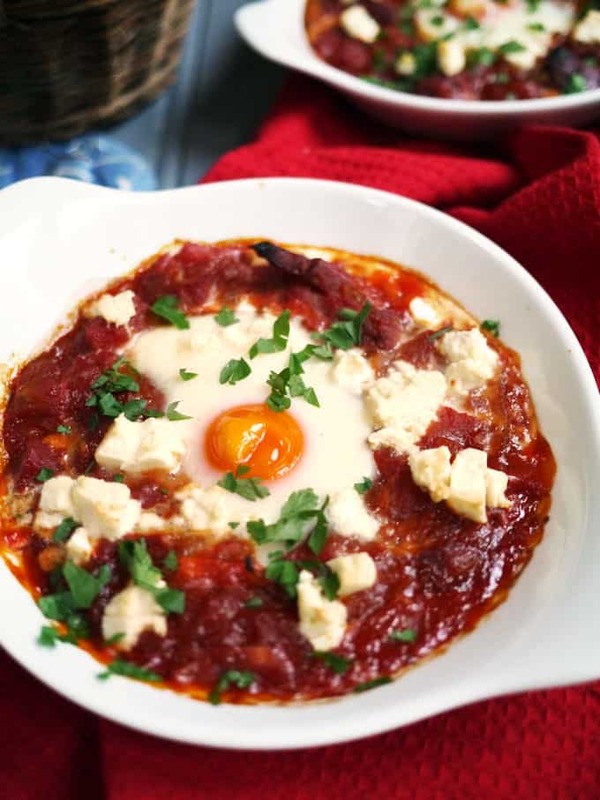 I make baked eggs often (without the chorizo though) and it is such a great standby!